I am doing a Fairy Tale-Folk Tale theme this year. It has been great because we are teaching the 7 Habits and this is so easy to do through the characters! This is a glyph we did. The boys made Baby Bear and the girls made Goldie! UPDATE: We've now posted the glyph in our TpT and Teacher's Notebook Stores! Go here for more info. 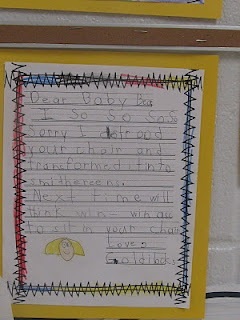 We are focusing on Win-Win this month... but Goldilocks was not thinking Win-Win... so we had to change her thinking :) She wrote Baby Bear letters saying she was sorry and what she will do next time!! For fluency practice we learned the Baby Bear Rap by Dr. Jean. They are soooo cute rapping this. I didn't let them hear her version until we read and reread it! They thought they did it better than her! 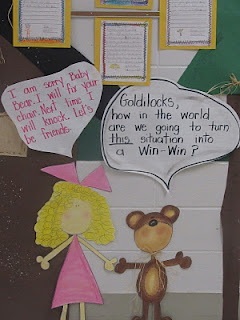 I also used Goldilocks and the Three Bears from the I'll Read to You, You'll Read to Me book. The boys read Baby Bear's part and the girls read Goldi's part. It was a lot of fun. To throw some nonfiction into the mix, I typed up some facts from Gail Gibbon's book Grizzly Bears! This has been a fun way to gather morning data!! Nobody went for the Cheerios!! They said that had to be Papa Bear's bowl! We have been comparing and contrasting different versions of Goldilocks!! There are soooo many I am afraid I won't get them all in before it is time to move on!! In stations I have them compare and contrast just the covers!!! They are getting really good and finding differences and finding how they are the same!! Breakfast with our bears!! They had a blast wearing their jammies to school and bringing their bears! On the menu... porridge of course... bear biscuits (you can get markers in the cake decorating section to make the face).. black berries, blue berries, and honey. They felt like I should have included some fish (gold fish)... next year I will have to remember that. I'd love to hear them!!!!!!!!! 100th day of school crowns (Thanks Carrie Warden for the idea) fit great with our theme. They did these at home. They had to glue 100 objects onto a crown (Thanks Burger King in Priceville, Alabama for the crowns)! Some of the students painted their crowns first! That is my class website if you are interested!! Ta-daaaaaa!! We finally did it! This is our very first blog entry. We are so excited to enter blogland. There are some splendiferous teachers out there (that's a Fancy Nancy word for wonderful)! We can all sharpen the saw when we share our ideas and creativity. Plus, it's just plain nice to know we're not alone on this journey. Hope we can bring something to the table that will make your day just a little easier and FUN! Kids learn so much more when they are in love with school. Don't you think?!? It was 1st grade's turn to do the BIG bulletin board in our school's front lobby. Thank goodness for the Love Bugs! They filled that space right up. On Valentine's Day we'll take them down and turn them into a scrapbook. The firsties will glue all their special valentines inside to keep foreveeeerrrrr! We once had a grandmother come in and share her valentines that she had saved from when she was a child. The children were enthralled with them. Click on any of the photos to purchase the patterns for our Love Bug Glyph on Teachers Pay Teachers. Looking forward to getting to know you all as we share and trade our best teacher secrets in the future! Angela is working away on some fabulous glyphs for Read Across America Week! Stay tuned! !